After missing BEA last year, I was excited to be back again for 2018! This year was totally different from my previous years attending in many ways, starting with the fact that it was kind of a last-minute decision! Now that Novelly Yours has become my main focus, I knew I wanted to attend BookCon to meet up with my candle reps, meet customers, and say hello to other bookish shops that were attending as vendors! My regular crew wasn’t attending BEA this year so I didn’t really have plans to attend but I still really wanted to. I managed to sneak in the last day of Book Expo with friend and rep Brittany (@bookswrotemystory) by my side and then we both hit BookCon with the rest of the rep crew! In previous years, I focused a lot on all of the things that we did day-by-day and this year, I think I’m switching that up a bit because things felt very different this year. I noticed that there weren’t as many bloggers in attendance, which could be for a number of things. I know that the BookExpo team switched some things around and changed blogger/media attendance fees. I don’t know if this was to cut down on/discourage blogger attendance in actuality or if the community just kind of felt like it was (those were the rumblings we all heard within the last couple years), but it did seem like there were fewer people I knew there… But there’s also the fact that there are a lot of newer bloggers on the scene now and a lot of the veterans that I know have taken a step back from blogging, or at least to the extent where BEA is not a priority. In that sense, it did seem a little less familiar. The pace of the conference is quite different from previous years as well. There are far fewer galley drops and books laying about the floor, free for the taking. Everything was much more scheduled and we had to line up for pretty much anything we wanted to do. I’m no stranger to standing in lines at BEA but I was also really looking forward to just walking around and trying to find some new, interesting reads this year and I couldn’t really even peep at any books. Everything was very protected, lots of secret drops that you had to be watching for on social media or things that were announced but the title kept a secret, and even more ticketed signings than in previous years. It’s not a bad thing — ticketed signings and and scheduled drops can help the organization process and keep things orderly, which I know was a concern among to blogging community if not all of the BEA attendees. It did make it difficult to do anything without a schedule and I was trying to be a bit more casual this year so those two concepts didn’t really work together, but I did manage to meet a few authors and grab a few ARCs that I really wanted to! I was surprised that there just weren’t really a lot of things to go and browse like there had been in previous years, not even with some of the smaller publishers. It was rare to see ARCs around on the floor to look at or take. Another perk of attending the one day of BookExpo was that I was in town for the Macmillan blogger party! They’re one of my favorite publishers and I still treasure our working relationship and how well I’ve grown to know the team and even the authors! I somehow always manage to get there late (this time it was because Laini Taylor was the last signing of the day and we needed MUSE OF NIGHTMARES and then we had to check into our Airbnb after moving out of our hotel) so I was rushed again getting there, but I stayed until the very end! I got to say hello to Marissa Meyer again (though I neglected to get a photo with her) and chat with Leigh Bardugo! I saw the lovely faces of the Macmillan team, spent time chatting with bloggers, and even got to meet a couple new friends that I hadn’t met before! It’s always such a fun time and it’s one of my favorite parts of the conference! This was the first year that I attended BookCon since its inception so I had no idea what to expect!! The first year was kind of a hot mess and they seemed to have it down to a science now this year. It was nice having it on the same floor as BookExpo and I already knew where everything was. The upsides of BookCon were taking the time to meet some other vendors like OwlCrate, The Bookish Box, Book Beau, North Ave Candles, and Beacon Book Box. I’ve met some of the owners before but it was nice to say hello to people for the first time and make some new connections as well!! I had also made some candles to hand out around BookCon and that was really fun to be able to meet some people that way and hand out some fun goodies! 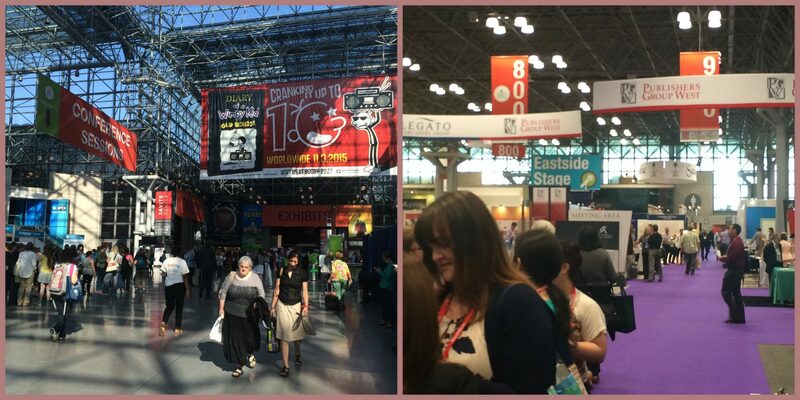 Other than attending as a vendor, I can’t say I’d ever go to BookCon as a regular attendee again. Every signing in the regular autographing area was ticketed and since I had a press pass and didn’t receive a BookCon badge ahead of time, I could register for any of them and a representative of BookCon didn’t get back to me to see if there was a way for me to do that. I didn’t push it because I knew I was going to BEA, plus I’ve attended many book events, so I didn’t want to take that opportunity away from someone else who really wanted to meet their favorite author! Most things on the floor were ticketed as well and I didn’t have desire to wait in a lot of those ticket lines so I just ended up walking around and hanging out with my friends most of the time, as well as making the time to chat with the aforementioned vendors! Nearly everything at BookCon is something that’s available for purchase, as well, meaning that unless I was buying books, I likely wasn’t picking anything up. Knowing how many books I’d have to tote back home, I didn’t feel like it was necessary to buy something all the way out in NYC and take it back to IL. A lot of people purchased books for signings but since I own all of the books from my favorite authors and I didn’t attend that many signings at BookCon, there was no reason for me to buy those either. I guess when you’re spoiled by BEA and ALA, getting books at BookCon felt silly (as weird as that sounds) but I also think the event is designed much more for consumers and the general public and not so much someone who can attend BEA or other book conferences like ALA. I think I ended up with 2 or 3 books from BookCon vs the other stack that I was able to obtain from BEA. I definitely had fun meeting the people and hanging out with my friends at BookCon but I don’t think I’d pay to attend just for me. Hopefully in years to come, I can participate in more of a vendor fashion, whether that’s having a booth or collaborating with another vendor! 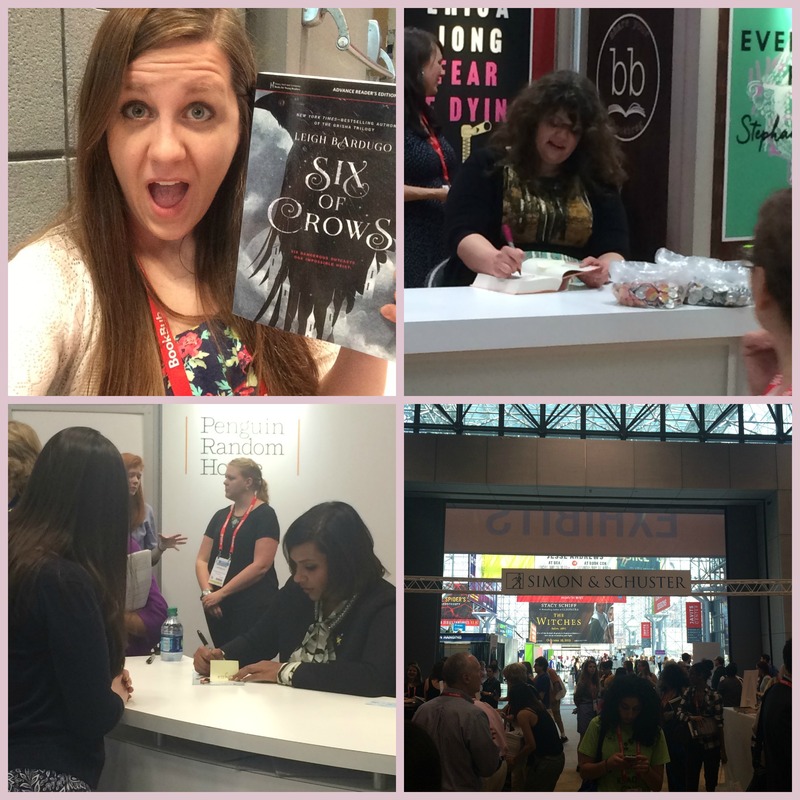 Did you attend BEA or BookCon this year? Have you attended in previous years? What did you think? This entry was posted in Author Signing, Books and tagged BEA, Book Conference, Book Expo America, BookCon, Books, Conference, New York, NYC on July 25, 2018 by Brittany. Well, I did BEA a little differently this year! For those of you who don’t know me or know me as well, I got married this past November so after taking a week and a half off for a wedding + honeymoon, I was trying not to take another full week of for BEA. 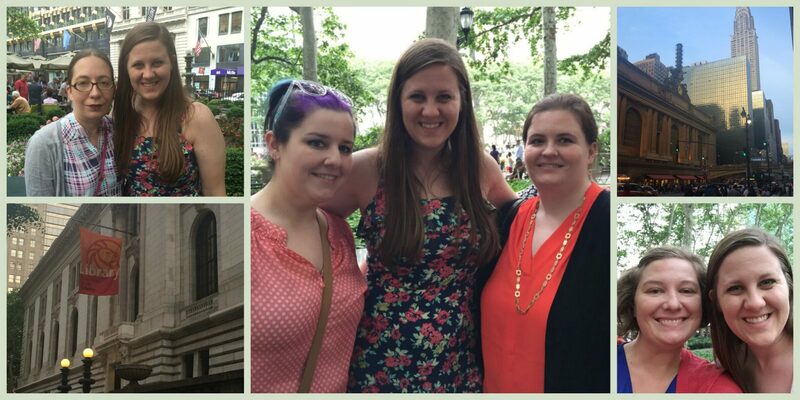 Plus, after discussing with my BFFs Amy & Alyssa, we decided to put the focus of our trip more on spending time with each other (since we only see each other in person twice a year) and only attending one day of Book Expo America. Friday morning we got up before the crack of dawn (literally. My alarm got me up at 4:15am) and got ready to hop the train from CT to NYC. I say hop, but really it’s a two hour train ride! BUT we’ve done it before and it’s a really nice way to save money instead of shelling out hundreds of dollars to stay in a hotel in NYC for a night! We were willing to sacrifice time (and sleep) to save a little money and it worked out nicely! We also got to meet Lauren from Bookmark Lit who is also from Connecticut so she carpooled with us to the train station and we headed to the conference together! After we taxied it to Javits (I’ll tell ya… sitting in the front seat of a cap was an experience), we were ready to take on BEA! This being my third year, Alyssa’s fourth, and Amy’s fifth attending BEA, we had a bit more chill of an approach. We fully planned on plopping ourselves in the signing line for Six of Crows by Leigh Bardugo but since that wasn’t until 10:30, we casually scanned the floor and walked around to check out the booths like we usually do. I was trying to limit myself to what I picked up on the floor and I grabbed a hardcover ARC of Illuminae by Amy Kaufman and Jay Kristoff which I’ve been curious about for a while! Plus… hardcover ARC!? Has anyone even heard of that before? I’m even more interested now! The book looks crazy, full of artwork, illustrations, notes, emails, logs, etc so I am definitely anxious to see what this is all about! Getting in line for Six of Crows was our priority really for the whole day so on to the line we went! We hopped in just at the right time (a little over an hour beforehand) because it started filling in pretty quickly after that and with this being our only real “must-have” book, it was worth the time to make sure we got a copy AND got it signed! There was a bit of Drama with a capital D when people got miscounted and were told they weren’t going to get books. Macmillan only had 100 copies reserved for the signing and several people came through to count the line (two line admins from BEA and the publicist from Macmillan) and people who were once “safe” ended up getting cut. There were a few stories going around but from what we saw and from what others heard as well, it sounded like they miscounted and let too many people in the line and then on top of that, an unexpected number of people used their “jump the line” passes (which I forget about every year) so that took away books from the people who were in line. Fortunately, my friends and I were safe but there were several people who got cut who were VERY unhappy. I totally understand because I would have been really upset if I had gotten cut BUT drama ensued when one lady took it way too far and started screaming at the poor publicist (whose fault it was not) and from what I hear, security was almost called on her after we left that part of the line. What people will do for these books, man. It’s intense. But long story short, it worked out for us and it was so lovely to see Leigh again because she’s just one of my favorite authors all-around. We wandered some more, found a few more bloggers, and I stopped by some publisher booths to say hello to Erica and Emily from Bloomsbury and Ksenia who’s now over at Simon & Schuster! We chatted a bit, made some plans, and then finally left BEA at around 3pm in search of food and refreshments! After food, it was on to meet up with some of our very best blogger friends! The conference was fun but we were more importantly attending to see some of the most wonderful people that we only get to see once a year at events like these! 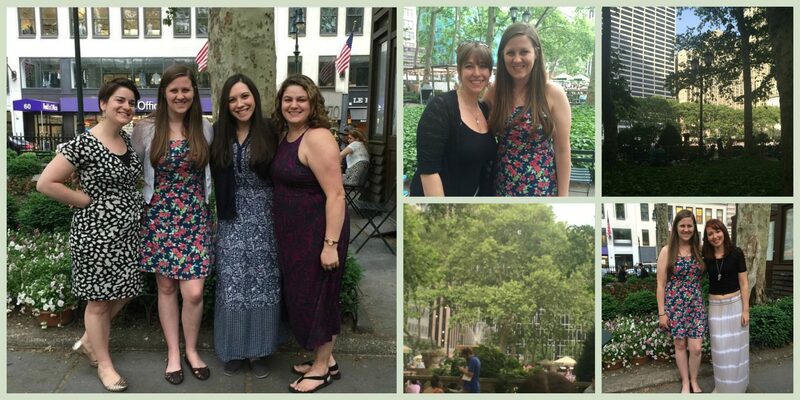 We gathered in Bryant Park just to talk and hang out and it was honestly the BEST time I’ve had at BEA. Publisher parties are fun and exciting and glamorous but to have all of your very closest blogger friends in one place? That’s priceless. We had a great time just talking about anything and everything — from what was going on with us to what happened on the conference — and I think we were all so excited just to be hanging out and not running around BEA trying to sneak in friend time! Nothing too out of the ordinary happened but it was just perfect that way. I got to chat with some great people and we were all very relaxed after a long day (for us, week for them!) until the party started to disperse for food, events, and even a date! We thought about stopping by The Strand after the day was done but we were just plain tired (and didn’t need to buy more books) so home we went! We stopped at Magnolia Bakery (as is tradition when we’re in Grand Central) and I got a nice iced coffee to quench my thirst and two cupcakes for the road! Two more hours back home on the train, another 40 minutes back to Alyssa’s house and it was time to crash! 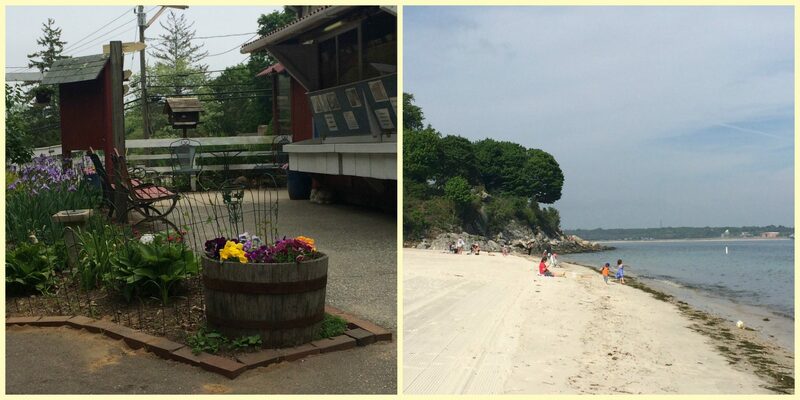 The rest of the weekend was nice too! I got to spend more time with Alyssa and Amy just relaxing, talking, and getting Thai for dinner on Saturday after we went to go see Pitch Perfect 2! It was a really great weekend and as always, I was sad to say goodbye, especially since we never know when we’ll see each other again in person! BUT I did miss my husband and sadly, I had to get back to the real world after a BEA and BFF hangover. My flight home got delayed but only by an hour so it wasn’t too bad (I seem to always have delays at Bradley?) so I hung out with Alyssa and her boyfriend for part of the day after we dropped Amy off at the train station. I got the airport a bit early and had to say another teary goodbye (it’s always hard) but then I had a nice time just decompressing after a busy few days with Six of Crows (yes, I already started reading) and a couple Yuenglings since I can’t get those in Illinois! I finally got on the plane and headed home, with my book in tow and another beverage since my sister had a free drink coupon that was going to go to waste! Not a bad way to end a great weekend! Did you go to BEA this year? Do you plan on going next year in Chicago? You know I’ll be there since I live in the ‘burbs! 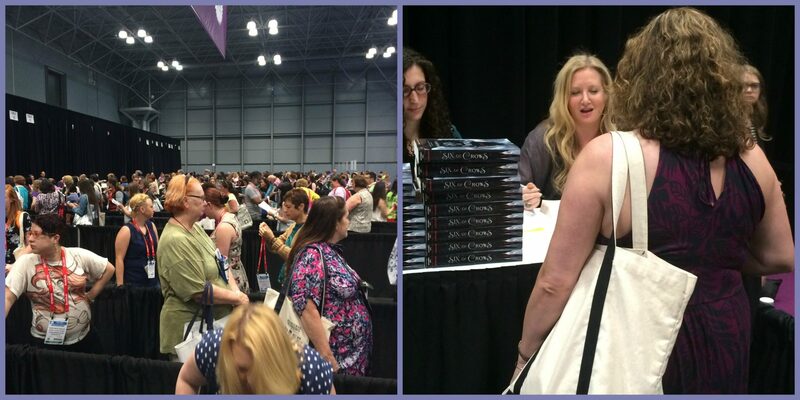 This entry was posted in Author Signing, Books and tagged BEA, BEA 2015, BEA15, Book Conference, Book Expo America, Books, Conference, New York, NYC on June 3, 2015 by Brittany.